Backpacking Background: Presently almost all my experience has been hiking in New Hampshire, Florida, Colorado USA, New Brunswick, and Nova Scotia Canada using an 11 lb (5 kg) day pack. I have backpacked on Mt. Washington and at the Imp shelter located between North Carter and Mount Moriah mountains in New Hampshire. The gear I will be writing about has been used a lot hiking mostly all year around in New Hampshire. I have completed the forty-eight 4000 footers (1219 m) of New Hampshire. My day hikes have been as long as 12 hours covering almost 20 miles (32 km). Items were packed in clear plastic. Items appeared new and in perfect condition. The Deluxe pad consists of a Nylon rip-stop full zippered case, polyester foam pad and Hinman air pad. The foam pad is open cell and molds to the shape of your body for amazing comfort. The material of the Deluxe pad case is green on the surface facing the user and grey on the surface facing down. I like the colors and the appearance of this system. The Hinman pad is self inflating and made with high density solid foam. It is covered top and bottom with 70D Nylon. A non-breakable brass valve is used to control the air in the pad. The feel of the valve is good, opens and closes easy and showed no sign of leaking. The warranty is simple. 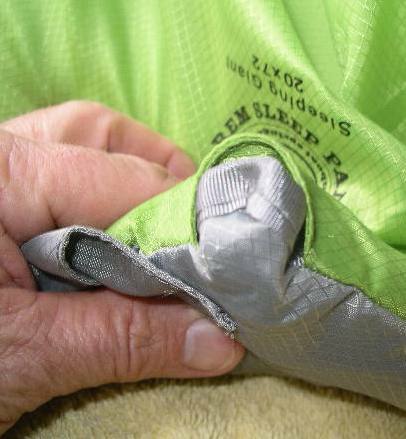 If you are not satisfied with any Big Agnes product return it for repair, replacement or refund. Damage due to misuse will be repaired at a reasonable charge. After assembling the foam pad and Hinman air pad I put it on the floor, spread a thin down quilt over pad and laid down on it for a few minutes. This quickly turned into an hour nap. The comfort I experienced is second to none. These products were made to fit well into the proper size Big Agnes sleeping bag, and the final result showed. 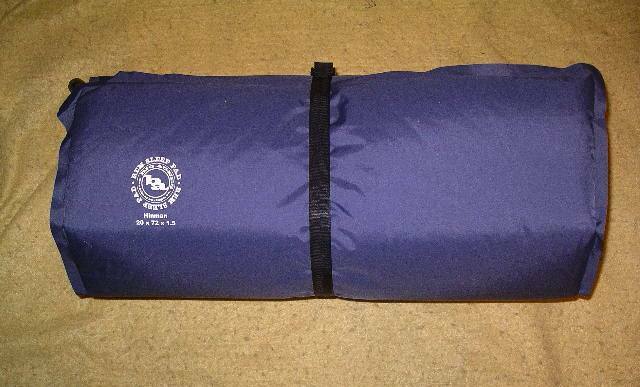 The completed unit fits easily into the Big Agnes Battle Mountain sleeping bag. The first tests will be at least 2 one night trips in a local forest. We have had nighttime lows of 0 F (-9.4 C). This will uncover possible problems. The next tests will be in a local forest East of Manchester New Hampshire. This is about 40 mi (64 km) North of my house and temperatures are typically about 10 degrees F (-18 C) colder. The tests will then move to the National Forest in New Hampshire. I have spoken with a Park ranger and have 4 possible places for testing depending on the predicted overnight temperatures. Some of these places have had temperatures as low as -20 F (-11 C). These places are located in Grafton and Lincoln New Hampshire. The places I have picked are 1-4 miles (1.6-6.4 km) from a parking spot. If problems occur the test plan will be modified for safety reasons. months from the date of this report. Please check back then for further information. My thanks to Big Agnes and Backpackgeartesters for the opportunity to test the Sleeping Giant Pad Upgrade Kit. There is a forest in Auburn New Hampshire where I like to backpack. It is relatively flat, with a lot of rocky hills and several ponds. The trees are a mixture of hardwoods and mostly pine. I also backpacked locally in Massachusetts when the temperatures were near or below 0 F (-17.8 C). My town has a lot of swamp land. There are small streams connecting many of these swamps. Most of this land is under conservation. I hiked and camped in three of these areas. One is flanked on the east side by the railroad. The west side is bordered by the Middlesex Canal (operational from 1793 to 1853). There is a small section of the canal that had been restored but now has gone back to nature. Beyond the canal is a cranberry bog that has not been harvested in over 45 years. Between this and the canal is a swamp once used as an aquifer for town water wells. The wells were closed due to contamination. The brush, thorny bushes and trees keep most people out of this area. Under certain conditions it is near ideal for radiational cooling, which means that the temperature drops lower just before dawn. On the south side of town there is a tract of land known as the town forest. It comprises a baseball field and hill high enough for sledding, skiing, etc. The Middlesex canal also passes through this area and there are some remnants that remain. There is a large swamp which is surrounded by an old pine forest stand. A third place is called Maple Meadows and is mostly owned by a club I belong to. This area has a lot of swamp and pine forest. Since I would be going to these places in the dark and most of this hiking would be without trail markings, I wanted places that I was familiar with. I picked evenings that would have temperatures below 20 F (-6.7 C). A cold spell was predicted for the next few days and this was time to backpack at or below 0 F (-17.8 C) conditions. I was also fortunate to receive my Black Diamond headlamp, this meant I could leave after dark. I left after supper and was on the trail by about 8 pm. The ground was completely snow covered and the surface was fairly hard. I put on my Kahtoola traction devices since there were going to be a few icy areas. I took my time as this was a heavier load than I was accustomed to. The wind was blowing at about 9 mph (14.5 km/hr). I had a spot picked out where some evergreen trees provided some shelter from falling snow. 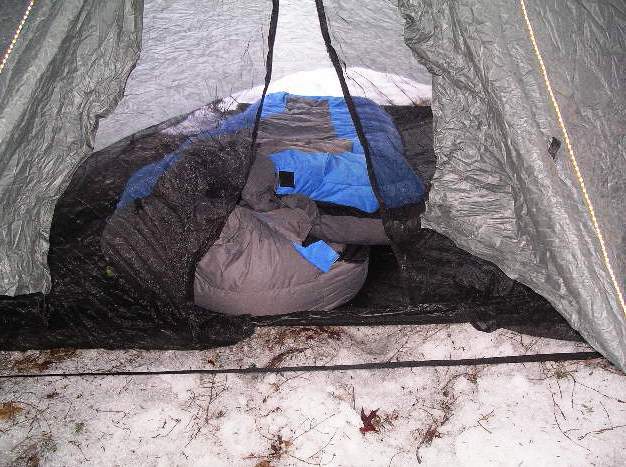 I pitched the Tarptent Cloudburst II with 5 stakes. With my knees in the tent and my feet outside the tent I assembled the Big Agnes sleep system. 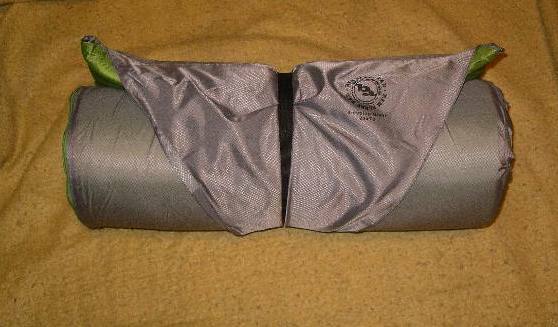 I had very little trouble inserting the Sleeping Giant foam pad assembly into the sleeve of the sleeping bag. I then found the valve, which was easy with my headlamp. I gave the valve a few puffs of air, closed the valve, and placed the sleep system on one side of the tent. I did this to see if this 2 person tent could handle another sleeping bag. I was using almost half the floor area, which left ample room for another sleeping bag or in my case, my backpack and shoes. I took my shoes off, placed them in the tent. I took off my coat off and then slid into the sleeping bag. I pulled out a digital thermometer from my pack and placed it so I could see it. It read 17 F (-17.8 C) and dropping. The bag was cold when I first entered, but warmed up quickly. I then found out I had enough room to take off my hiking pants, fleece top and socks while in the bag. I placed them along with my coat inside the bottom of the bag where there was a lot of space. I looked at the thermometer and it was still dropping and then as it read 14.7 F (-9.6 C), the reading went to all LLL. It turned out that when the temperature got above 14.7 F (-9.6 C), the device started working normally. I was glad I discovered this before taking it on a longer trip. A friend called me on my cell phone. He knew I was going out and wanted to know how I was doing. I was warm and almost toasty. I then realized that I had not closed the front tent flaps. I was too comfortable to close them. I then found the book I had brought and read with the headlamp for awhile. I sleep on my side, and most of the time it is on my left side. I shift from side to side during the night but tend to spend more time on my left as I had shoulder problems at one time. I started on my right side facing the zipper and this worked well. At some point I shifted to my left side and I felt a little cool on my back where the zipper was. I found lying on my back was the warmest and most comfortable position, but not one I could fall asleep in. The small down pillow I had inserted into the pillow sleeve worked extremely well. I prefer to have cotton to put my face on, so I had a small cotton cloth to place over the synthetic covering. I woke up early and checked the ceiling on the tent and found it was free of frozen moisture. I have seen moisture collect on previous occasions. I packed up and went home. It was about 0 F (-17.8 C) when I got home and was probably close to that where I was sleeping out. These temperatures correlated well with those of Hanscom Air Force Base located about 10 mi (16.1 km) west of my location. Temperatures did not rise much during the next day and it was predicted they would go even lower during the next night. I decided that it would be a good chance to try sleeping out again at a lower temperature. I did things pretty much the same except for 3 things. I started the night with the clothes I had taken off, along the inside of the zipper. Also I decided to close the front flaps. Even closed there is still about 18 in (46 cm) of open space at the ground level. There was no wind. As the night progressed I began to feel a cool spot where my hip rested against the sleeping bag. All other parts of the sleeping bag were toasty warm. When I did my temperature correlation it was about -5 degrees F (-20.6 C). The air pad is rated at -5 F (-20.6 C), so it was at the design level. 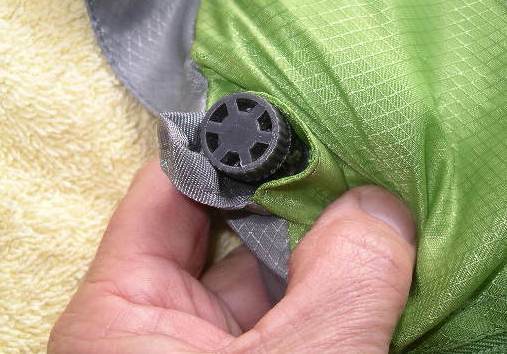 The pad on this system being a part of the sleeping bag makes it an extremely stable system. There is plenty of space for me to move around. The other thing I noticed is that there were large ice scales on the ceiling of the tent. This was a formation I had not seen before. This was at least 27 F (15 C) degrees colder than the weather when I had used this tent previously. The snow and ice had prevented me from backpacking in a forest in Auburn, New Hampshire, as I could not park within a reasonable distance from the trail. When conditions improved, I did a one-night backpack. I arrived just after dusk and due to cloudy conditions, it was quite dark. It had been warm, so there was some melting, but now it was cold and very icy. I put on my traction devices and headed for the spot I had planned to stay. I needed my headlamp, and had to use the brightest setting. I found the pond which was completely snow covered and locating the edge of the pond, I setup the tent about 12 ft (3.7 m) away. I brought the Battle Mountain, Sleeping Giant upgrade kit and air pad into the tent. Inserted the air pad into the upgrade kit and then gave the air pad a few puffs and inserted the pad assembly into the sleeve in the sleeping bag. In about 15 minutes I was in my bag, comfortable, and ready for some reading. The temperature was about 20 F (-6.7 C), but felt colder due to high humidity. I left the front flap of the tent open to minimize humidity in the tent. I slept very well until 5 am when I awoke, finding myself cold. I put on my second layer of clothes and found that the inside of the sleeping bag had cooled since the time I had gone to sleep. The clouds had cleared during the night and the temperature must have dropped considerably. I was not cold enough to be concerned, but cold enough to want to get up and head out. With the clouds cleared it was a lot brighter in the predawn than the previous night. In the morning I was able to see that the Sleeping Giant pad had protected me from the rough surface of the ground. I am very impressed with the comfort of the Big Agnes Sleeping Giant pad system. I find it like sleeping on my mattress at home. It assembles quickly. The specifications on the product are very accurate. I found lying on my back was the warmest and most comfortable, but not one I could fall asleep in. To get this comfort there is more weight to carry. I will be doing more backpacks with temperatures hopefully not much colder than -5F (-20.6 C). I will be backpacking with someone in the Mt Monadnock area of New Hampshire. I am hoping to be using a Big Agnes 3 wire Bivy for the remaining backpacks during the testing period. This concludes my Field Report. The Long Term Report will be amended to this report in approximately two months from the date of this report. Please check back then for further information. I wish to thank Backpackgeartesters.org and Big Agnes for the opportunity to test this fine product. Originally I had planned 3 one night overnight backpacks in the Lincoln New Hampshire area. The good news this year was that New Hampshire set records for snowfall. The bad news was that on 3 weekends when I traveled to prospective trailheads, I was unable to negotiate the ice and snow in the parking lots with my Scion XA. I was able to do some hiking in areas where camping is not allowed. I then made phone calls about the trailhead in southern New Hampshire and found that there was ice where I would be parking. I have recently returned from a one night backpack in a forest east of Manchester New Hampshire. I spent 3 one night backpacks in a local forest which is flanked on the east side by the railroad. The west side is bordered by the Middlesex Canal (operational from 1793 to 1853). There is a small section of the canal that had been restored but now has gone back to nature. Beyond the canal is a cranberry bog that has not been harvested in over 45 years. Between this and the canal there is a swamp once used as an aquifer for the town water wells. The wells were closed due to contamination. The brush, thorny bushes and trees keep most people out of this area. Under certain conditions it is near ideal for radiational cooling, which means that the temperature drops lower just before dawn. The temperatures for these backpacks ranged from just above freezing to a low of 13 F (-10.6 C). There was little or no wind on these backpacks. The ground was covered with snow or ice on the first two backpacks with the exception of small areas under the evergreen trees and a few bare spots where it was rocky. On the third backpack most of the snow was gone but the ground was frozen and icy in places. The ground under the shelter was frozen and ice glazed. The forest east of Manchester is fairly flat with some rocky outcrops, several small ponds and a mostly hardwood forest. At the time I backpacked there this time all the snow and ice had gone. The first backpack was started knowing that a rain storm was coming and could last all night and for most of the next day. It was after sunset when I started and the temperature was just above freezing and the humidity was high. There was little or no wind. Due to the rain arriving, I decided to pick a closer location to camp. I set up where evergreens gave some protection. I got into the sleeping bag slowly and with some difficulty. Once inside, I left the sleeping bag unzipped and only zipped the sack to about eye level. This way I could see out and have as much ventilation as I could without expecting rain to enter. This also made it easier to remove my outer clothing layer. I read for a short period before going to sleep. I slept comfortably for about 6 hours. When I woke up, I was warm and it was raining moderately. I started to feel around and found that almost everything I touched was wet. I turned on my headlamp and inspected my surroundings. There were big water droplets all over the ceiling and the pole. Also the visor was really wet underneath. I had to use my fingers to check other areas and found that there was a lot of water on the outside of the sack, but only a small amount of dampness between the sack and sleeping bag. The part of the sleeping bag behind my head was wet. There were large drops of water falling from the trees. When these drops hit the visor, sometimes it was as though I was hit by a small mist. 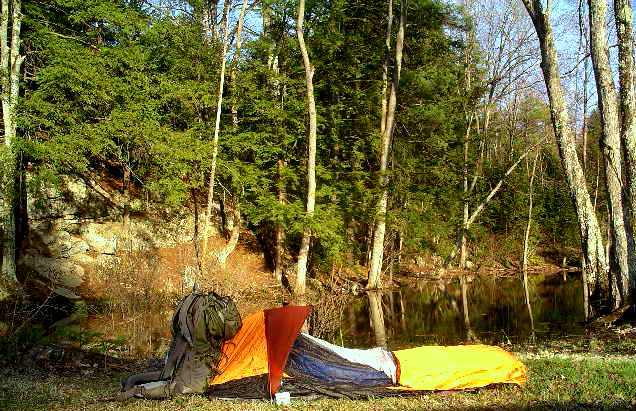 Even though there was dampness on the exposed surface of the sleeping bag, I went to sleep again quickly. When I woke the next time, the rain had reduced to a drizzle. I decided to pack and leave before it really started to rain. 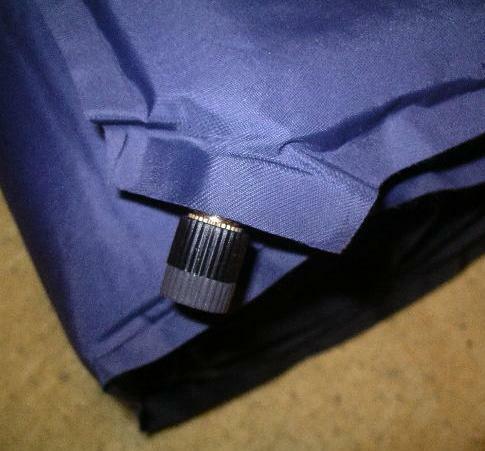 Being able to access the valve on the air pad without having to unzip the pad cover makes for a faster take down time. When I got home I found that the foam pad and its cover were dry; however, I spread it out along with the items that had gotten damp or wet. Everything was dry within 4 hours. It was almost 2 hours after sunset when I started the second backpack with a temperature of 15 F (-9.4 C) and a slight wind coming from the north. The Sleeping Giant Upgrade Kit and accompanying sleeping bag fill most of the space in the Bivy and there is little room for shifting. To get in this time, I knelt on the Bivy, took my boots off put them in a plastic bag and put them inside the head end of the Bivy. I took off my hiking jacket and put it inside the Bivy head also. I then crawled into the front end of the Bivy and inserted my feet into the sleeping bag and slid backwards facing down to get in. It is still not a quick operation. Once inside the sleeping bag I took off my outer layer and realized that I had left the zipper on the sleeping bag open. I found I had to get out and crawl down head first to get the zipper attached. It seemed easier than removing the sleeping bag from the Bivy. It was accomplished with the aid of my headlamp. I found that the outer zipper in the Bivy sack gave me full control of the air flow into the canopy area. I soon became warm and toasty. I did a little reading and soon I was asleep. When I woke several hours later, I checked for condensation and found none. I checked everywhere I could reach and did not find any moisture. I was also comfortably warm. Soon I was back to sleep and when I awoke again, I was still very comfortable and I could not find any condensation anywhere. I was time to pack and return. The temp had dropped to 13 F (-10.6 C) during the night. This was a really good experience. The third backpack was started about 2 hours after sunset with a temperature of 20 F (-6.6 C) and there was a light breeze all through the night. The frozen surface was quite rough and quite slippery in places so I made full use of my Kahtoola traction devices. This being the third time setting up using the 3 Wire Bivy and Battle Mountain Sleep System, I was setup and ready for some reading in a very short time. With little chance of rain, I stopped zipping the Bivy where the zipper makes a turn upward. This allowed a little more area for ventilation. I also had the Battle Mountain sleeping bag zipped half way. I kept the foot of the sleeping bag open a small amount to allow for ventilation. I woke up only once during the night and in the morning I found all surfaces were dry. I had spent a very comfortable night. The temperature had dropped to 16 F (-8.9 C) by morning. I was packed and heading out before dawn and was able to see the sun rise before arriving home. I checked all the gear for dampness and found everything dry. I still spread the gear around for a few hours before storing to make sure things were are dry. For my fourth backpack, east of Manchester, New Hampshire, I arrived at my camping place at about 5:30 pm. It was warm, so I put my temperature/humidity meter out and recorded 82 F (27.8 C) and 56% humidity. While I was setting up, a pair of wild ducks flew in and settled on the pond. I could also see tracks of wild turkey near the shore. After setting up, I became aware of the No-See-Ums and I was ready to do some hiking. I hiked for over 3 hours and when I returned it was 49 F (9.4 C) and 76% humidity. The frogs in the pond were also quite noisy. I read for only a short time before going to sleep. At midnight I woke and found my legs were sweaty, so I opened the Bivy bag and the sleeping bag as much as I could. I then lifted my legs several times to ventilate the bags and then went quickly back to sleep. When I woke at 3 AM on my back, my right side (the open side of the bag) was cold and my left side was warm. The temperature had dropped to 38 F (3.3 C) and 86% humidity. I was cold but not uncomfortable. I closed up the sleeping bag and quickly went back to sleep. It was almost 6 am when I awoke, the temperature had dropped again to 32 F (0 C) and humidity was 86%. There was some condensation on the unexposed surface of the sleeping bag. I packed and headed for the trailhead. When I got home, even though the gear felt dry, I spread it out in the sun. Over the test period I have gone on 8 one night backpacks and was comfortable and warm except for the one time I woke up and was cool, as described in the fourth night of the field report. The temperature ranged from a low of -5 F (-20.6 C) to a high of about 49 F (9.4 C). The Sleeping Giant Pad Upgrade Kit provides for me a level of comfort equal to my bed at home. I like the comfort and warmth of the foam pad. In order to get this level of comfort I had to carry more weight and use more space in my backpack than I would prefer. My experience with the zipper was excellent. The cover for the foam pad integrated well with the air pad. I was always able to find the valve on the air pad and it was kept clean by the special protected opening in the foam pad cover. The overall condition of the Sleeping Giant Pad Upgrade Kit is in the same condition as I received it. I am very pleased with this product. This product has worked well over a temperature range of 33 F (0.6 C) to -5 F (-20.6 C). Because of the comfort it yields, I will use the Sleeping Giant Upgrade Kit as my sleeping pad for most and possibly all of my backpacking trips. I will also use this product for other types of camping that I may be doing. This has opened a new venue of backpacking possibilities and extended the number of days I can camp out but more importantly it has increased my comfort level. I plan to use the Sleeping Giant Upgrade Kit as a sleeping surface when I am a guest in a house. I would like to thank BackpackGearTesters.org and Big Agnes for the opportunity to test the Sleeping Giant Upgrade Kit.